Can I Add users who do not have an Email ID? You are here: Home / Administration / Can I Add users who do not have an Email ID? Office Chat allows you to create accounts in your office chat network without any email address. If you have employees who don’t have a company email address, and you don’t want to use their personal email address (@gmail / @yahoo, etc.) but need them to be part of the groups created in your office chat network. If you want to create office chat accounts that represent rooms, stores, reception desk, nurse station, etc. Which don’t have a real email address and perhaps different people in shifts use the rooms/front desk/reception desk, nurse station, etc. and need to communicate in groups. 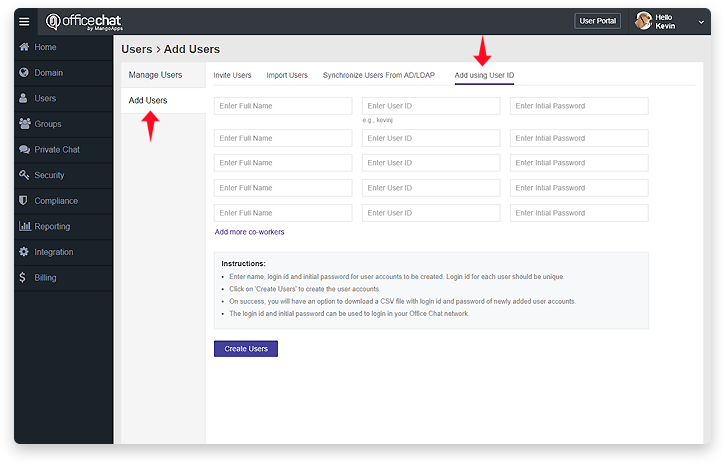 3) Here look for the ‘Add using User ID’ tab.